A description of boat design terms and how they relate to boat performance. Just a fancy term for the measurements and characteristics of a boat. Also known as Beam Over All (BOA). The width at the widest point of the boat. Also known as Length Water Line or Load Water Line (LWL). The length of the boat measured at the waterline. Used to determine "hull speed". In general boats with longer LWLs will be more efficient at high speeds. In other words long LWLs general make boats faster. As the term "Load Water Line" implies this is the length of the waterline when the boat is loaded the design displacement. Also known as Beam Water Line (BWL). The width of the boat measured at the waterline. This is a primary determinant of initial stability. The Design Water Line (DWL) determines the total amount of weight the boat was designed to carry. This is a some what arbitrary number. The boat can carry more or less, but the other particulars are only completely accurate when the combined weight of the boat, paddler and the gear it is carrying is the same as the DWL displacement. How far below the waterline the boat reaches. This does not include rudders or retractable skegs. The surface area of the part of the boat that is under water. Lower wetted area means less frictional drag. The area of the water plane. The waterplane defined by the waterline outline. The total surface area of the skin of the boat. You can get an approximation of the weight of the bare boat by multiplying by the density of the wood strip and fiberglass layupyou are using. A good starting point is 0.7 pounds per square foot for a typical 1/4" layup with 6 ounce glass. The weight of the boat before adding seats, hatches, rudders or any other outfitting. This is approximated by multiplying the Total surface areaabove by 0.7. and assumes 1/4" western red cedar strips with 6 ounce cloth. For a better estimate use our boat materials and weight calculator. 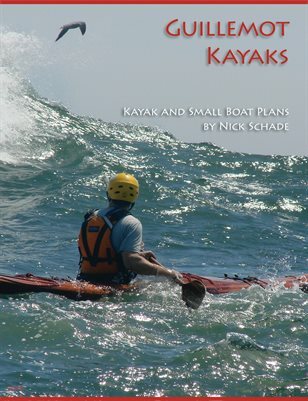 The total volume of the kayak. The volume of water that the boat would displace if it were totally submerged. Same as above in gallons. This is a rough measurement of the "fineness" of the boat shape. A boat with a "fine" shape has quite sharp ends. It is used to estimate drag. The typical range is roughly 0.5 to 0.7. Higher numbers tend to be more efficient at higher speeds and lower number more efficient at lower speeds. The prismatic coefficient was originally developed as term for hull design analysis by Admiral David W Taylor in 1943. The area of the waterplane divided by the length and width of the boat at the waterline. The lateral plane is what you see below the waterline when looking at the boat from the side. This coefficient is the area of the lateral plane divided by the LWL times the Draft. The fore and aft location of the Center of Buoyancy relative to the middle of the boat. Here it tells you how far behind the middle of the boat the Center of Buoyancy is. Often abbreviated as: B, CB, or COB. The location of the geometric center of the waterplane area relative to the middle of the boat. This is where you would add more weight for the boat to sink straight down. Often abbreviated as:F, CF, COF, or LCF. The location of the geometric center of the lateral plane relative to the middle of the boat. An approximation of how much weight you would have to add to sink the boat another inch. It will generally require more weight to get a full inch, but if you want to go up or down 1/10th inch, one 1/10th of the Sinkage added or subtracted will be pretty close. The amount of torque required to push the bow or stern into the water about 1 inch. This is an indications of how quickly the boat will rise over waves. How much torque is required to tip the boat a small amount. An indication of initial stability. The VCG is used to calculate the "Moment to change Trim" and the "Righting Moment" above and is important for determining stability. Most of the data on these pages assume a VCG that is 10.5 inches above the bottom of the boat.